The floor to ceiling windows of the White River Fish House offer guests the most beautiful view of Lake Taneycomo. 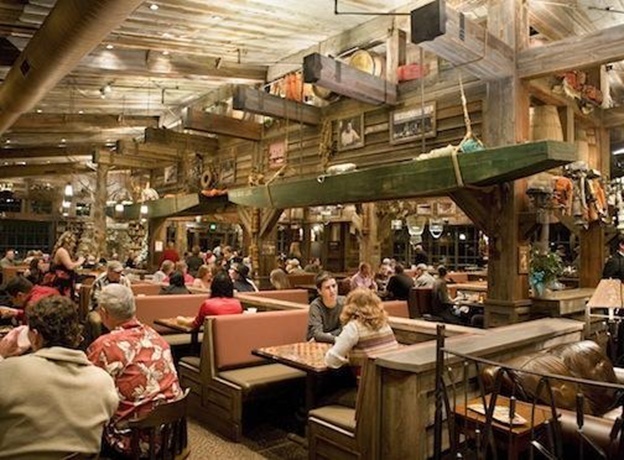 As one of the newest restaurants in Branson, White River Fish House is owned by the world-famous outdoor outfitter, Bass Pro Shop that serves delicious food to fishermen and shoppers alike. Whether you arrive by boat or car, you are sure to enjoy the great menu selections in a relaxing atmosphere of the restaurant. Boaters who want to stop for a respite and enjoy a cold beverage can park their boat on the pier. This scenic restaurant was recently named the Best Restaurant in Branson by 417 Magazine offering guests one of a kind atmosphere and outstanding service. White River Fish House is a floating restaurant that offers great dining atmosphere, picturesque views of the pristine Lake Taneycomo, and beautiful scenery along the foothills of the Ozark mountains. This floating restaurant near the Branson Landing promenade is accessible to many city attractions, world-famous entertainment district, and to areas with great shopping and fine dining options. This elegant restaurant on the lake can accommodate up to three hundred people in one seating in the main dining area. The restaurant offers the best specialty menus from BBQ to pasta and seafood dishes that feature some of the Ozarks traditional taste and flavors. Some of the delicious appetizers of the restaurant include the Alligator Tails with tender American alligator, seasoned batter, deep-fried to a golden crisp, and served with a homemade gator sauce; Smoked Wahoo Dip with Islamorada original recipe straight from the Florida Keys, served with crackers; Venison Stuffed Mushroom served with five mushroom caps and stuffed with venison sausage, and smothered in mozzarella in a black iron skillet; and Flash Fried Crawfish Tails with bite-size morsels hand-breaded, served with a rich sherry wine sauce. This beautiful floating restaurant in Branson also offers a wide selection of salads that include White River Salad, mixed greens with candied cashews, goat cheese (tossed with raspberry vinaigrette dressing), green onions and dried cranberries; Caesar Salad, assembled with fresh romaine, homemade croutons, classic dressing and parmesan cheese; and Fish House Cobb with sliced eggs, mixture of field greens with tomatoes, smoked bacon, green onions, avocado and crumbled bleu cheese. These salads include toppers such as Chicken Breast (grilled or fried), Grilled Shrimp Skewer, Chilled Smoked Trout, Seared Sirloin, and Grilled Salmon. So, if you want to spend a unique dining experience in a floating restaurant on Lake Taneycomo, visit the White River Fish House at Branson Landing where you can enjoy great food with a relaxing atmosphere and a spectacular view of the lake.